Josh Moreman scored for Peterborough Sports at Newcastle Town. Reports of Peterborough Sports getting found out at Evo Stik Division One South level appear to have been exaggerated. The city side travelled to a strong Newcastle Town side having failed to win any of their last five matches in the division. They hadn’t won away from home all season and they’d suffered a chastening 9-1 home defeat in their previous outings. Henry Eze (left) scored for Stamford AFC at Alvechurch. But Jimmy Dean’s battlers showed great bouncebackability to collect three points - and keep a clean sheet - as they triumphed 3-0 with goals from Mark Jones and Josh Moreman in the first half and Jordan Macleod after the break. Sports are 13th in the Division One South table, two places behind Stamford AFC, who claimed an impressive 5-1 win at sixth-placed Alvechurch, and nine places behind Spalding who cruised to a 2-0 success at home to Chasetown. Gary King and Nathan Whitehead scored for the Tulips with Ashley Carter, Jordan Smith, Henry Eze, Jon Challinor and Liam Adams on target for the Daniels. The local cream is starting to move towards the top of the United Counties Premier Division. 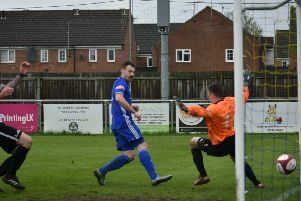 Deeping Rangers are sixth after a fourth win in six matches, 3-0 at Oadby, secured by goals from Scott Mooney (2) and Scott Coupland, while Yaxley are not far behind them after goals from Tom Waumsley and Matt Sparrow clinched a 2-0 win at Wellingborough Town. Ollie Maltby scored twice for Pinchbeck at Lutterworth Athletic. Newboys Pinchbeck are up to second in Division One after coming from behind to beat fellow high fliers Lutterworth Athletic 3-2. Ollie Maltby, a goal machine for the club in the Peterborough Premier Division last season, made it 12 for the season at the higher level with two goals, while Josh Smith also netted. Blackstones are also going well in fourth place after a 2-1 win at Long Buckby. Matt Harrold and Danny Barker scored their goals. March Town United slipped to 14th place in Division One of the Eastern Counties League after a 2-0 home defeat at the hands of Sudbury. Divsion One South: Alvechurch 1, Stamford AFC 5 (Carter, Smith, Eze, Challinor, Adams); Newcastle Town 0, Peterborough Sports 3 (M. Jones, Moreman, Macleod); Spalding United 2 (King, Whitehead), Chasetown 0. Premier Division: Oadby Town 0, Deeping Rangers 3 (Mooney 2, Coupland); Wellingborough Town 0, Yaxley 2 (Sparrow, Waumsley). Division One: Long Buckby 1, Blackstones 2 (Harrold, Barker); Lutterworth Athletic 2, Pinchbeck United 3 (Maltby 2, Smith). Division One: March Town United 0, AFC Sudbury 2.